Since that time, the amount of literature and other media on eating disorders has increased many times over and I find it hard to imagine an American girl who wouldn’t recognize at least some of the more obvious signs of these disorders in a classmate. The very modest silver lining of our preoccupation with weight, body image, and achieving physical “perfection” may be that we’re all more aware of the dark side of this focus for girls. Boys, however, are another story. Research indicates that boys now comprise up to 10% of all cases of anorexia in this country. But public perception may not be keeping pace with the dimensions of this growing public health problem. While much remains to be said on the sociology and science of this phenomenon, a new book by YA author Lois Metzger provides some haunting insight into the personal toll the disease takes on both patients and those who love them. 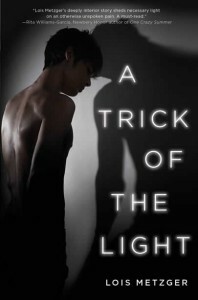 A Trick of the Light tells the story of Mike, a 15-year-old boy who develops an eating disorder, and his struggle to regain control of his life. This moving and informative book is available today at bookstores and online. Ms. Metzger, who is the author of three other novels, (as well as being my sister-in-law), talks about the process of writing the book here and here. Thanks for this review! The continued rise of eating disorders among youth AND adults is so discouraging. I fear attention to EDs has been lost, or at least buried, by the obsession with the supposed obesity "epidemic". I'm glad to see a new YA novel exploring EDs among boys. And congrats to Lois!